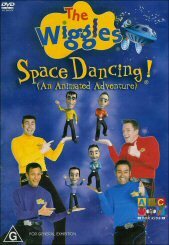 The Wiggles embark on their latest adventure in outer space in the sensational animated journey called Space Dancing! This is the story of what the Wiggles look like when Jeff doesn't wake up and so the Wiggles go into Jeff's dream to see what he does when asleep. Using state of the art animation, this DVD will keep your kids enraptured from the start to the very finish. As always the Wiggles have their trademark catchy tunes that kids and adults alike will be tapping their toes to. The animation on the title is spot on and you are not trying to work out who anyone is (discounting their coloured tops of course which make it a dead giveaway). The adventures and creatures they visit are varied as they learn that in dreams you can use your imagination and do anything you like. This leads to many fun and amusing tales that are shown in the DVD. The thing that as a parent watching the disc is that there were a number of extras on the disc, my favourite being the making of the feature which is extremely informative, yet presented in such a way that even the kids will enjoy it. It's one of the ways that the Wiggles are so attractive to all ages, they don't speak down to the kids, they just make it easy to understand. Another great feature of this disc is the option to turn subtitles on and off allowing kids of a reading age to sing along with the songs. I love The Wiggles and I know that your kids are going to as well.